Although most people use WordPress for its graphical interface, there are benefits to being able to control the software from the command line. A tool calledwp-cliprovides just this functionality. 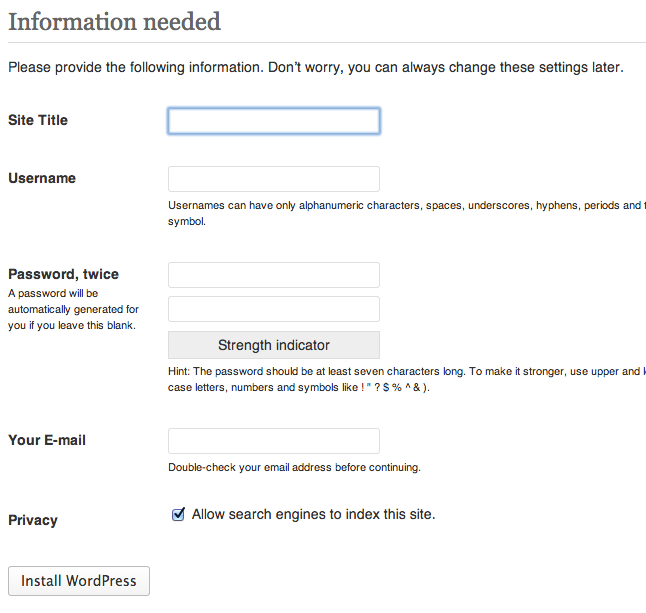 This guide assumes that you have created a server using the WordPress application image from the creation page. If you need assistance doing this. You should be in the root user's home directory. This will install a few tools needed to make the software function correctly. Next, we will create a.bash_profilefile for our root user and add the path to the wp-cli executable and the auto-complete script. Now, we have the interface installed and we can begin using it. If this is a completely new server instance, then you have not even completed the basic configuration. If you have gone through the site initialization process already, feel free to skip this step. Error: The site you have requested is not installed. However, since this is a guide on how to use wp-cli, we will fill out all of this information in a single command. We do this by doing the core installation. wp core install --url="your_domain_name"  --title="Your Blog Title" --admin_user="admin" --admin_password="your_password" --admin_email="your_email"
You can see all of the top-level sub-commands that wp-cli uses to manipulate different areas of WordPress. In this way, you can get help with just about any aspect of the system that you wish to use. To demonstrate some basic usage of wp-cli, we will do one of the first things that anybody does when they create a new blog: get a new theme. As you can see, we have two themes installed, and we are currently using one called "twentythirteen". This is fine, but it's a bit boring. Success: Showing 5 of 5 themes. We have two themes installed, but neither are active. If you are comfortable composing posts with a command-line editor, you can make entire blog posts through the wp-cli interface. Hello. This is my first official blog post. I hope to be adding some additional content here soon. wp post update 1 --post_title="An Introduction..."
I am becoming quite prolific. One of the most useful features of wp-cli is integration with the SQL backend. For most common database operations though, you control it directly from the wp-cli interface. Now, our post should have an author listed as "admin" beside our content. You should now have a pretty good handle on how to complete tasks in WordPress through the command line. This is not only a fast and easy way to manage multiple sites for different clients, it also provides very nice scripting capabilities to do very complex tasks easily. By effectively using wp-cli, you will no longer have to continually switch between the web browser and the terminal window when doing changes that might not be available from within the web interface. Posted by: ASPHostServer Administrator - Sat, Jan 4, 2014 at 6:03 AM This article has been viewed 8291 times.